WHO: The 3 Day Refresh is for anyone who needs to kickstart their routine, break through a weight loss plateau, get ready for a big event, cleanse after a vacation or stressful time, or who needs a little detox and reset! WHAT: It is a 3 day vegan-friendly program that allows you to detox and cleanse without having to do any drastic fasting. On the 3 Day Refresh you get to drink delicious smoothies and eat real food. WHEN: I, personally, think this program is IDEAL before a big event when you want to look your best because it helps you get rid of bloat! Think before a cruise or special event like a wedding. Or... when you get back from a vacation or any phase of life where you've been reckless in your nutrition and you just need to reset and start fresh! WHERE: The 3 Day Refresh is available in my shop and there are also links to it at the bottom of this post! You do it in the comfort of your own home or you could take it on the road with you! It's super simple to follow and you don't need much for it! WHY: This program is Beachbody's answer to other similar cleanses and crash diets. But unlike juice fasts or liquid cleanses where you shock your system and metabolism, this is a gentle and nutrition-packed system that INCLUDES real food (albeit, just produce cooked with minimal extras) and amazing shakes so you don't feel deprived! Facts are great, but I know you're curious about my personal experience so here you go! Above is all what I ate and drank (water excluded) during my 3 Day Refresh. As you can see, I was not deprived! Although I will be 100% honest with you and tell you that even with all this food, I was still having a hard time resisting my cravings for sugar or carbs. It took a lot of self control for me not to make myself nachos at midnight! But I did it! And I felt great. I never felt lightheaded or like I wasn't getting enough to eat. In fact, it was quite the opposite, I felt like I was eating or drinking something constantly! On the refresh you drink Shakeology in the morning along with a fruit. Then a little bit later you drink a fiber drink that you mix with water. It tastes slightly sweet and slightly citrusy. It is by far the best fiber drink I've had, although I'm a texture person and it was something I had to power through (I told you I was gonna be honest didn't I?!) A little bit later for lunch you get to have another smoothie called Vanilla Fresh. This is a NEW type of smoothie and is PACKED with protein (20 grams!) and is VEGAN! You also get to eat a veggie serving and a healthy fat! You can have a healthy snack between lunch and dinner from the veggie section and then at dinner you get another Vanilla Fresh shake and you can pick from the vegan veggie-centric dinner options in the booklet. So... what I'm saying is... you eat A LOT of veggies during these three days! HAHA! My honest thoughts? This is by far the best cleanse I've tried. I only had a light headache the 2nd day and I didn't miss my coffee nearly as much as I expected. (My vegan chocolate shakeology smoothie in the morning really filled the void for me!) Night time was the hardest time for me as I craved comfort foods but I kept telling myself that it was only 3 days and I could do anything for just 3 days. I also worked out 2 of the 3 days and felt like I had more than enough energy for it! No light-headedness like I've had on juice cleanses in the past. That is a HUGE bonus for me! So... I know you're all curious... how did it work? I lost 4 pounds in 3 days. (Full disclosure... I got my period the last day so my results may have been thrown off a bit my mother nature. I'm thinking I probably would have seen another pound or two come off if I wasn't dealing with the joys of womanhood.) 4 pounds in 3 days is pretty amazing! Especially on a no-starvation cleanse. The biggest change I noticed was the bloat on my midsection decreased DRAMATICALLY! My abs were much more visible at the end and my hips smoothed out a bit! I felt clear-headed and energized. I slept better. I woke up easier in the mornings (even without coffee!) and I didn't have big energy spikes and dips throughout the days. 2. 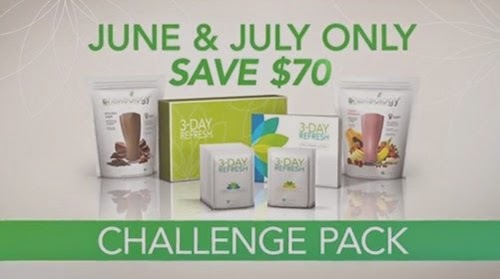 3 Day Refresh CHALLENGE PACK | This option gives you an entire month of Shakeology so that you can keep up the healthy habits after your refresh is done. And it's priced at a big discount! Booyah! 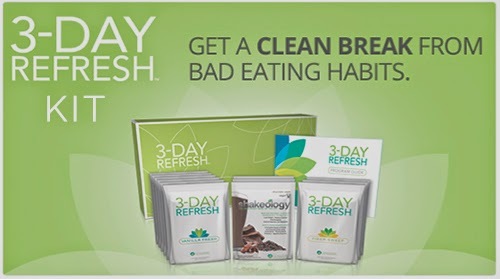 You get the entire 3 Day Refresh Kit plus a month supply of Shakeology so that after you finish your 3 day refresh you can sustain the healthy habits and hopefully continue your amazing results! Click the buttons below to purchase each for yourself!